A virtual trip to the Emerald Isle is always a pleasure for us fans of online slot machines and this game from OpenBet gives us one more chance to cross the Irish Sea; it’s called Pots O’ Luck, it comes with some tasty free spins and a progressive jackpot. 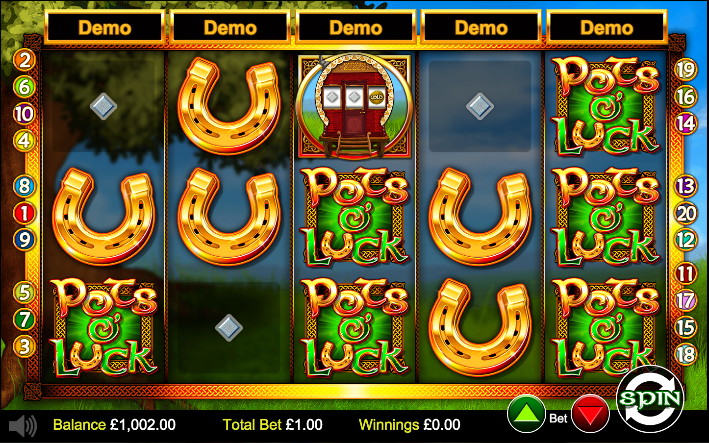 Pots O’ Luck is a five reel slot with three rows and twenty fixed paylines; there’s a golden theme to the design of this game and a view of a familiar rural landscape through the transparent symbols. It will be immediately obvious that there are very few symbols in Pots O’ Luck – in fact just the Pots O’ Luck logo and the golden horseshoe for the standard ones. The small diamonds are blanks and worth nothing. The wild symbol is the double golden horseshoe but this only substitutes for the standard horseshoe to help make winning combos; the shamrock is the scatter symbol and there’s also a caravan bonus icon. Each time the caravan symbols appears on the reels you’ll trigger this little feature; that caravan contains some tiny reels which will spin and if a win is achieved you’ll receive seven free spins on that set of reels. The symbols shown to the right are the ones in play here and if you can land three pots of gold you’ll win the progressive jackpot amount shown above the reel where the caravan landed. This is triggered by landing four or more of the shamrock scatter symbols anywhere in view and all you have to do is pick one of those symbols to reveal a prize which will be multiplied by the total bet. Pots O’ Luck has a familiar theme but it offers something different to many other slots with it’s sparing use of symbols and interest caravan feature; it coms with an RTP of 94.29% and is certainly worth a look.